Eleven-metre-deep trenches now crisscross the platform to accommodate 1.6 kilometres of concrete piping. Maximum diameter: 2.2 metres. There was a time when the 42-hectare ITER platform was as flat as a pancake. Now, as work progress on the deep underground drainage network, the landscape is in some areas reminiscent of a World War I battlefield. Eleven-metre-deep trenches now crisscross the platform to accommodate 1.6 km of concrete piping. 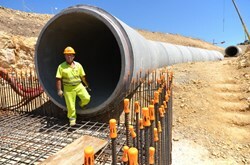 These pipes, measuring up to 2.2 metres in diameter, will collect rainwater from the platform buildings, roads and trenches. A branch of the underground network has been designed to evacuate the overflow of a "centennial rain" — extreme rainfall that, statistically, occurs only once every century, but that can lead to water flow estimated at 17.8 m³ per second. Based on this estimate, a safety margin of approximately 20 percent has been applied to the calculation of ITER's underground rainwater network, which has been dimensioned for a flow of 21.5 m³ per second. The whole network connects to the storm basins located at the southwest corner of the site through an underground network that was put in place by Agence Iter France during the site preparation phase. This giant plumbing operation, which necessitated the removal of 50,000 m³ of earth, began in March and will be completed in November.